The death of a prominent breast cancer awareness campaigner highlights the fact that, although breast cancer rates in China are lower than those in Western countries, younger women are increasingly at risk. Liu Zhihua reports. Prominent breast cancer awareness campaigner Yu Juan died on Tuesday, drawing attention to the killer disease. The 33-year-old's blog, chronicling her triumphs and setbacks in her fight against the cancer, has drawn 3.2 million visits, raising awareness among younger women in particular. Yu passed away in a Shanghai hospital on Tuesday at 3 am. Yu was diagnosed with breast cancer when she went to see a doctor in late 2009, as she had unbearable back pain. She was told she had advanced metastatic breast cancer. The cancerous cells had spread to her bones, causing the back pain. "I always thought breast cancer was something older women got," said Yu, mother of a 2-year-old son, and a promising faculty member at Shanghai's Fudan University. "I was so wrong," she said. According to the latest report of the bureau of disease control and prevention of the Ministry of Health, the incidence of breast cancer in the country stands at 43 per 100,000. Although this is lower than in Western countries - it is about 100 per 100,000 in the United States - breast cancer is hitting Chinese women at a much younger age. An epidemiological study by the Cancer Foundation of China shows most breast cancer patients in the country are between 40 and 49, which is about 10 years younger than in the West. The study covered more than 4,200 breast-cancer patients on the mainland between 1999 and 2008. The root cause of breast cancer remains unknown, but many experts link it with high levels of the hormone estrogen, says Wan Donggui, a breast cancer specialist at Beijing's China-Japan Friendship Hospital. Unhealthy lifestyles, high-fat diets and lack of exercise can cause estrogen to rise to abnormal levels and increase the risk of breast cancer, Wan notes. Young people are prone to adopt such lifestyles, which is one of the reasons breast cancer is becoming more common among younger women, according to Professor Zhang Baoning of the Cancer Hospital of Chinese Academy of Medical Sciences. The report by the Health Ministry also shows that urban women are more likely to get breast cancer - the incidence being 49 per 100,000 - than those in the countryside, where it is about 17 per 100,000. 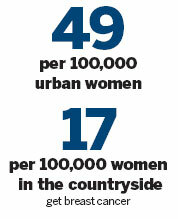 Young women in the cities have to deal with the pressure of heavy workloads. Many of them choose not to have children or have them later in life, and all these are risk factors for breast cancer, Zhang explains. Being pregnant lowers a woman's total number of lifetime menstrual cycles, and this offers protection against the disease. In spite of the increasing cases of breast cancer, Wan says people know little about it, and this is an even bigger threat. "People tend to have extreme responses to breast cancer because of ignorance. Many pay no attention to it in daily life, and become terrified if it comes along," Wan says. But the fact is breast cancer is a relatively less fatal cancer compared to others, Wan says. A number of treatment options, such as surgery, chemotherapy, radiation therapy, hormone therapy and traditional Chinese medicine, are available. Medical advances have led to fewer deaths from breast cancer in China, although its incidence is rising. "Prompt treatment is crucial," Zhang says. "The earlier the cancer is discovered, the easier it is to save lives." Beijing resident Liang Jun was diagnosed with early-stage breast cancer in 2005, when she was 50. She went to see a doctor after experiencing an ache in a swelling in her breast, which she attributed to an accident. When told she had breast cancer, she burst into tears and even started to write her will. "I was convinced the cancer was fatal," Liang recalls. In the past six years, she has undergone surgery, chemotherapy and radiotherapy. "I am still alive. It is not as bad as I thought it was," says Liang, an active member of many organizations aimed at promoting awareness of breast cancer in Beijing. Around 80 percent of early-stage breast cancer patients can live at least another 10 years if properly treated, Zhang says. "Regular checkups are a must," he adds. Mammography can help detect breast cancer in its early stages, when there are no symptoms and the cancer is still confined to the breast. Although the relative benefits of mammography are disputed because of the potential risks of exposure to radiation, and they are not advisable for women under 35, those over 40 should have a mammography done once a year, Zhang notes. 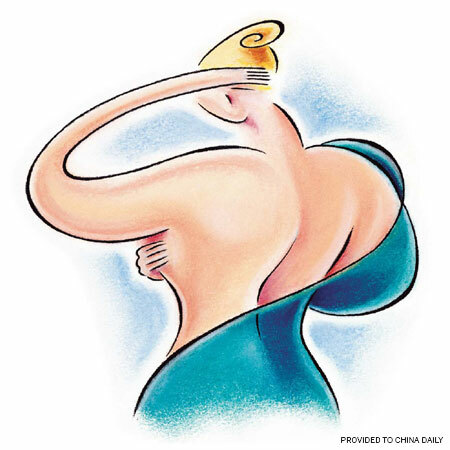 When the cancer causes symptoms such as lumps and skin changes, breast self-examination can be a life-saver. Doctors say women should know how their breasts normally feel and look and see a professional if they notice any changes. Even if the changes are not caused by breast cancer, seeking help can identify other potential breast problems, such as benign fibrocystic breast disease. Experts say early detection is essential and having a healthy lifestyle is one of the first steps to reducing risk. 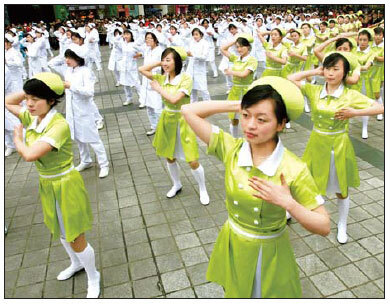 Yu, the former breast cancer patient in Shanghai, had said she regretted some of her previous habits. She said in her blog that staying up at night a lot and indulging in high-fat foods were the main reasons for her cancer. "I hope others can learn from my experience," Yu had written. "Slow down and shake off the pressure. So-called wealth and success mean nothing if you risk your health."